There is overwhelming agreement that the most important outcome of the election is a stable government. When there’s overwhelming agreement about anything in Irish politics, it is usually wrong. If this is stability, why should we fear fluidity? Wasn’t it the cult of stability that made Mubarak the “best leader” for Egypt? The paradox of our current political situation is that there can be no stability without radical change. Any attempt to keep the show on the road, to trim the sails a little but remain on essentially the same course will fail and fail quickly. Even Fine Gael understands that what has happened is a kind of revolution. Enda Kenny calls it a “democratic revolution”. Alan Shatter, perhaps articulating more openly what many in the party really feel, calls it a “blue revolution” - blue as in Blueshirt and Tory. But which is it? A democratic revolution implies a radical reassertion of Irish sovereignty, a popular revolt, not just against Fianna Fail, but against the bank bailout and the EU-IMF deal as well. A blue revolution, on the other hand, means simply that one tribe is out and the other is back in. The two propositions are not just very different. They are incompatible. To be fair, it is not easy to interpret exactly what the election means. The people have spoken but beyond the furious scream of “We hate Fianna Fail”, what are they saying? Two very different things. A small majority - those who voted for Fine Gael and Fianna Fail - has broadly endorsed the bank bailout and the IMF-EU deal, albeit with some rather vague hope that the deal can be renewed on better terms. Most of the rest - those who voted for Labour, Sinn Fein, the United Left and a broad sweep of Independents ranging from Shane Ross to Mick Wallace - want to tear up the deal and start afresh. Very crudely, the country is split between those who want a democratic revolution (a radical change in policy and culture) and those who want a blue revolution (a shift of power, albeit an extreme shift, within the existing governing consensus). It is fair to say that, for the small majority that voted for a modified version of current policy, stability really is the primary goal. Having two big right-of-centre parties gives Irish conservatism both belt and braces. It can manage the dramatic gesture of whipping off the belt to whip Fianna Fail’s behind, knowing the braces will ensure it is not exposed. But this stability is impossible. Minor adjustments to the current regime will also mean minor adjustments to mass unemployment, mass emigration, rising poverty and inequality and economic torpor. The goal of reaching a deficit of 3 per cent of GDP by 2014 is fanciful. And, in any case, Labour can’t survive in a government that is imposing vicious austerity on its voters while diverting tens of billions to pay off private banking debts. Labour’s position, with the best result in its history, may look great but it is actually excruciating. It may have avoided (mistakenly in my view) the “default” word, but in practice it needs something very like it. Assuming Labour goes into government, there are just two possibilities. One is that there is a successful confrontation with the EU at the end of March which changes all the parameters. The other is that the EU sends the new government home with a few cosmetic concessions and instructions to carry on as heretofore. The second of these scenarios is by far the more probable. If it comes to pass, we know all the rest. The government will become deeply unpopular because promises of real change have not been realised. The smaller party will take the biggest battering, as it always does. 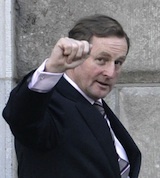 Fine Gael will consolidate its position as the party of orthodoxy and “responsibility”. Labour will be devoured from two sides, its radical support eaten by Sinn Fein, the ULA and Independents and its “respectable” support consumed by Fine Gael. The voters who were ruthless enough to decimate Fianna Fail will think nothing of decapitating Labour. The very strange reality is that Eamon Gilmore will know which way it is to be within a few weeks of taking office. By the end of March, the results of the EU summit will determine whether Labour can credibly claim to be achieving real change or whether it is just a set of new faces implementing the old injustices. It is hard to see how the party could weather the second option. In a crisis, stability is impossible without revolutionary transformation.